Formatting multipart/form-data for UniBot can be pain when the form is big (with 10+ fields) and the possibilities to make a mistake are huge. This is the reason I've created a little bot, which helps me a lot and I hope it will help you too. It is created to help to the advanced members and to the new users as well, which will see such multipart/form-data POST for a very first time and won't know how to deal with. After you download the "multipart form data parser" bot, create blank text file form.txt in the same folder, where the bot is placed. 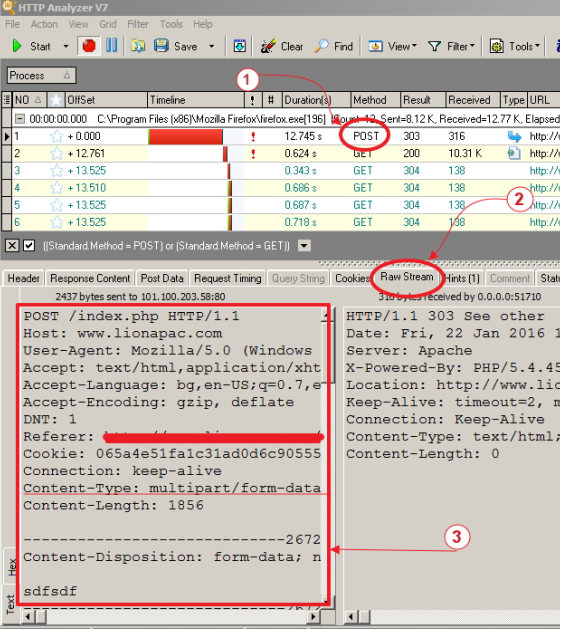 Run HTTP analyzer and catch the multipart/form-data request. (Click on Start button, and then submit such form in the browser). Copy everything from the left field. Then paste it in the new created form.txt file and save. Then run the bot - and the output is your POST data in the format ready for UniBot. Last Edit: Jan 31, 2016 12:53:21 GMT by MikiSoft: Little corrections. In my opinion, this is so far the greatest contribution - so congratulations on the power member rank, and keep it up with such things! You need proper form.txt file along with the bot.